Copyright, 1887, by Chas. D. Blake & Co. Words and Music by C. E. Randall. We are sitting by the fire to-night near the closing of the year. Would you know what my hands contain and why my heart is sore! They hold a well worn leather case and the glasses mother wore. Then do not deem me weak or mad, or mock these falling tears. But she will never be forgot, nor is there in earth's store"
A diamond half so dear to me as these glasses mother wore. As I gaze on these bright crystals my mother's face is near. But, no! alas, "it cannot be, my heart it is so sore. 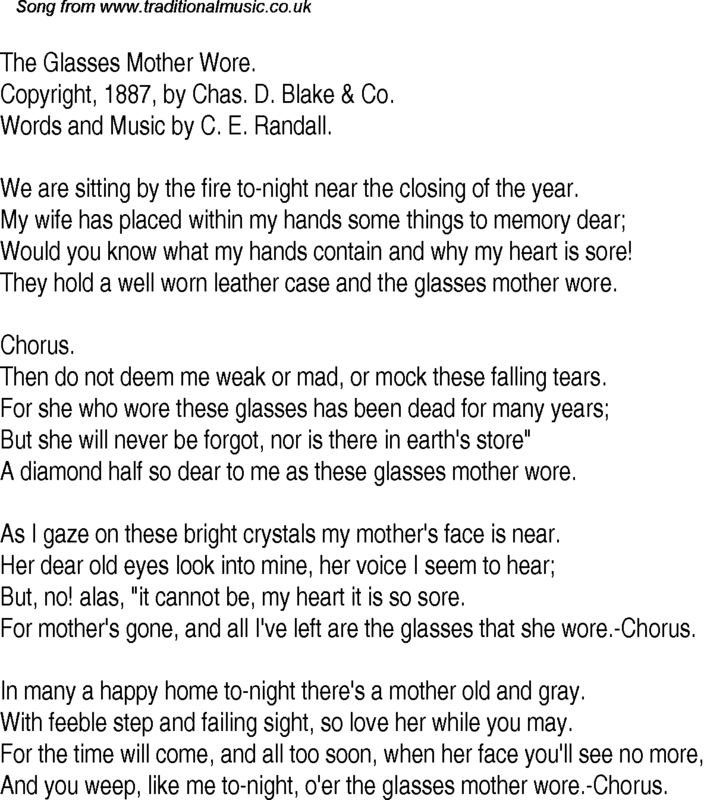 For mother's gone, and all I've left are the glasses that she wore.-Chorus. In many a happy home to-night there's a mother old and gray. With feeble step and failing sight, so love her while you may. And you weep, like me to-night, o'er the glasses mother wore.-Chorus.